What an elemetary menu might look like. Here's another high school one. 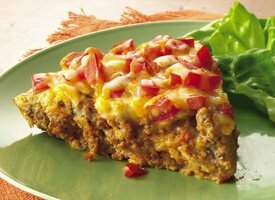 I had to look up taco pie. Bleah! I see Occupy Wall Streeters have been defecating in "interesting" places again. What would an "all-meats" pizza be categorized as? I think meechele is getting tired of pictures of her shoving mountains of food down her face that is unhealthy. They label it healthy and she can shovel away with no worries or bad PR. A vegetable since there is at least 2 tablespoons of tomato paste on the pizza. That's all it takes to be classified as a vegetable according to the government. Why do you do this? Seriously...is it a sickness? New York City will force you to eat less salt. You don't have a choice. Nanny State. It's what you wanted. I'm not the one huffing down piles of fat laden foods and telling others what to eat. She is. Ask her why she's doing it. A gazillion pounds of meat classified as a vegetable. If I could get that past my doctor, I'd have a little peace come check-up time.